One needs to clearly understand that any object of enjoyment ultimately becomes a source of unsatisfactoriness because of its impermanent nature. For example, one enjoys being with a pleasant, charming and beautiful person. One likes to be with him (or her) again and again. One derives pleasure and satisfaction from that person. But this enjoyment is not permanent, just as that person and all his (or her) attractions are not permanent. As the situation changes and as one no longer is able to derive that pleasure and satisfaction, one becomes sad. One may become unreasonable and unbalanced. One may even behave foolishly. This is the evil, unsatisfactory and dangerous side of the picture. Now this won’t be the case if one is completely detached. Then there is freedom, liberation. This is true with regard to all enjoyment in life. From this it is evident that we must take into account not only the ordinary suffering, such as, sickness, old age, distress, etc., but also the impermanence of the pleasures of life. This is dukkha. But the philosophic aspect of dukkha as impermanence goes much deeper. What we call a ‘being’ or an ‘individual’, or ‘I’, according to Buddhist philosophy, is the perceived center of physical and mental forces. These forces or energies are forever changing. They are expressed as the five aggregates of attachment. They are not the same for two consecutive moments. Here A is not equal to A. They are in a flux of momentary arising and disappearing. So, there is no permanent, unchanging spirit which can be considered ‘Self’, or ‘Soul’, or ‘Ego’, as opposed to matter. Consciousness is not perceived as Self or Soul that continues as a permanent substance through life. Conciousness changes continually. There is nothing in life that is permanent. All the aggregates are impermanent, all constantly changing. Buddhism advises us to take a realistic view of life and of the world. We must look at things objectively. We should not be falsely lulled into living in a fool’s paradise, nor should we be frightened and agonized with all kinds of imaginary fears and sins. We should look exactly and objectively what we are and what the world around us is. And that would guide us to perfect freedom, peace, tranquility and happiness. The Western religion of Scientology calls itself an extension of Buddhism. It claims to improve upon Buddhism. As far as dukkha goes, Scientology replaces it with the concept of Reactive Mind. To me, Scientology is not an extension of Buddhism. It alters the very basis of Buddhism. Religions are taped paths extending off into a direction. The power of my religion depends upon my faith in my religion. The strength and value of my path depends upon my faith and preconception of the final destination of my path. But Scientology is no Buddhism. What is your fixation on Scientology? I am looking at Scientology to understand what in that subject helped me the most, and what didn’t. Consciousness is not perceived as Self or Soul that continues as a permanent substance through life. “”””Conciousness changes continually.””””” Consciousness NEVER EVER CHANGES one can not be aware less or more than one would be doing something but how it is explained “”consciousness changes continually” is one experiences and the experiences that fraction of moment has different energy: more or less. Example: one is in a beautiful quiet meadow in a hot summer day one experiences that quietness but it is in fact existence of millions of creations in harmony. One is on the see, in a small boat on the windless day and the fog has taken over the surface of the sea and the waves smoothed out.. nothing can be heard or seen… Nothing yet what is there is a total harmony of many creations. One is in the middle of a huge city, standing in the middle of Time square : honking, creaming, shouting, singing off tune, thousands foot steps melting into the thundering noise… gun went off, there is creaming, sirens going, One is aware of millions of clashing colliding sounds -energy of total disharmony. It is a experience what is different and not the consciousness. When one is locked into a dark room where sound can not enter… consciousness is still the same.. but the momentary experience is very different. Consciousness is a addition because if we say I am conscious hearing-feeling this or that than judgement has entered and singularity is there also, so is the SELF.. In my opinion, consciousness depends on what one is being conscious of. Since things being conscious of are changing continually, the consciousness is changing continually too. What is the difference between consciousness and the experience of now? In my view they are the same. There is no separate “point of consciousness” looking at things. We are part of what we are aware of. That is how I see it. When one looks at things as they are, it becomes impossible to harbor any ill-will. Yes, you are right. Ill-will is generated when one is being judgmental. Ill will and good will are attachments. All attachments fall away as one practices Looking. Looking is attachment.. that is doing something– being aware of doing =looking=observing. Looking would be a doingness if one is exerting to look, as in searching, or digging into the mind, but not otherwise. Being quite opposed to melancholic, et al, is inconsistent with releasing attachments. Maybe this is badly translated? Possibly “joy” is badly translated as well? Possibly. With the practice of Looking one sheds of attachments. It is from attachments that unwanted feelings of melancholy, sorrow, gloom, etc., arise. The natural state seems to be one of calmness and serenity. What about calm and serene are unattached? I can see lots of judgement entered here,: what is bad and what is good really comes from personal judgement. I would expect melancholy, sorrow, etc. not to be there when one is being mindful. If one is really mindful being in the NOW in that fraction of creation than pleasure moments are not the part of Now because any pleasure moment simply exist because judgement of doing something so is sorrow etc.. etc.. It can not be both ways that one say ”bad experiences should be eliminated and just keep the pleasure moments because they are good and lets create more of it because.. Yes. When one is being mindful, the judgment in terms of good or bad is not there. One can look at the illusion forever. Can the observer be seen? This looking will bring one to enlightenment. What illusion are you talking about? There is only the inconsistency of considering things to be permanent when they are not. That which plays on the holographic ‘screen’ of consciousness. These seem to be various theories. Buddhism seems to consider that the observer and the observed are part of the same system, and thus dependent on each other. I don’t like using the word illusion because it does not communicate too well. What’s the point (purpose/goal) to all this looking? What use is looking at the mind or manifestations of mind? From where/what does this mind arise? That seems (to me) to be a better place to do one’s looking. That, which seem to consider is the ‘being’ defined by the five aggregates. See KHTK 11A. What underlies the ability to consider is ‘mental volition’, which is a mental formation. See KHTK 13A. Considerations at any moment are limited by what has been considered earlier and held on to. Anything disagreeing with what has been considered earlier, and held on to, appears as an inconsistency. In my opinion, such inconsistency would precipitate dukkha. The point of looking is to resolve inconsistencies and minimize dukkha, whether it is looking at the physical object, or looking at the mental objects. 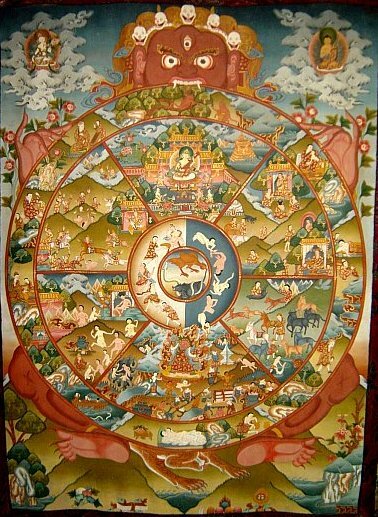 According to Buddhism, one thing arises from another in a circle of Conditioned Genesis. Thus, the mind arises from those things that, in their turm, arise from the mind. This Conditioned Genesis is mentioned in the Second Noble Truth (KHTK 13A), but it is explained more fully later in the Third Noble Truth, which I have yet to study. I find Buddhism to be more and more interesting as I dive into it. Paths…. How far must one travel to find oneself? When the dreamer dreams, the dream seems to be quite real. The sun shines, illuminating the scene in the dream. But, if you stand next to a person having a dream, can you see the dreamer’s shining sun? No, there is no light shining for you. Is the sun objectively real to the person in the dream? You have never been other than what you are – ‘native state’ is here, now. Can this be experienced? In my opinion, the ‘native state’ is beyond the consideration of ‘I’. ‘Whatever is impermanent is dukkha’. Yes, I, is a bundle of thoughts – mental. It is impermanent, ever changing. It is dukkha. What is not dukkha? Look at that. That is freedom. To go beyond dukkha, I believe that it is necessary that none of the inconsistencies are ignored, but are fully resolved. You can believe it if you like. But there is no need to erase the mind to achieve enlightenment. You just need to find out who you really are – with total certainty. Well, you’ll have to define ‘thing’ in this context. If a thing means something that one can perceive with the senses, then I think it is fine that you find out that you are not a thing – a no thing. By “thing” I mean anything that one can be aware of! I believe that dukkha is a much deeper concept than the concept of Reactive Mind in Scientology. After the Reactive Mind is gone, plenty of dukkha may still be there. Maybe the OT levels are addressing that! What OT levels? None of the ones that have been released so far. OT VIII’s EP – I know who I am not. That is ridiculously funny and sad. Then is nothing something that one cannot be aware of? If so, then it does not follow that one could come validly come to such a conclusion. hehe you can’t really find this out, now can you? Well, if you can’t locate something that you better accept that you can’t locate something. Nothing is not something. Nothing is ‘absence of something’. It is not a matter of conclusion (thinking). It is a matter of looking and discovering. What I am saying is the possibility that one is not something should not be ignored. That “one is something” seems to be a popular belief. I question that belief. I’ve just read Essay #2: SOMETHING AND NOTHING. Perhaps I should comment on it there, but, I’ll do so here as this is where we’ve been conversing. If this is the definition of nothing, then to conclude that one IS nothing is an error. Time is an illusion – there is only and has only ever been NOW. Brian, These are like little pieces of a demonstration kit that you have before you on the table. You move them around however you like to demonstrate your significances to you. Something and Nothing — fun to work with, but Truth? Ooof! Maybe all of life is like that. You may certainly comment under Essay #2: SOMETHING AND NOTHING and I shall add it to the CURRENT DISCUSSIONS page, so others may access it easily. You talk about ‘concluding’, but I don’t think it is a matter of concluding. Logic has its limitations. I would rather say that it is a matter of being aware of one’s assumptions and keep looking. Yes, it looks like dukkha is real, doesn’t it? But, wait till you find the unknowable (nirvana). Ha, ha. Fractal is not the circle but the branching. The circle is not precisely Natural that I can see. It represents something irrational and we strive to understand that irrationality. I believe the Truth is that the Circle of Life is a mockery. It is self-similar, but it is not circular. There is something to know here. In a fractal the same algorithm is repeated again and again. Call it whatever you may. If you brush it off, you will miss my meaning and the poignant differences. Fractal is never circular. Life is never the circular, it is fractal. It is not the returning but it is the branching. The Circle is not precisely Natural that I can see. It represents something irrational, and we strive to understand that irrationality. I believe the Truth is near to this: The Circle of Life is a mockery of itself. Life-forms are self-similar, but they are not circular. Only Consciousness is truly circular as it pinches off to “Become” only to dissolve that becomingness and return to itself. There is something to know here. Maybe the fractal contains the seed of lying, with its little alteration of each iteration? Because of the constant alteration per each iteration; the fractal construct can be viewed as the source of persistence. Yes. It gives the appearance of persistence. And regardless of agreement, I would like to ask you to see how this model of physicality can show how discreteness fits. Within these few words contain the possibility of motion, change, relative mass, the tendency for organized systems to disorganize and the constant speed of light to name a few attributes off the top of my mind. What would cause a collection of coordinates to organize? Is this the same reason whether at the macro or micro levels? Sorry, it is too cryptic for me. People have written many books on such topics. One cannot reach the understanding of unknowable through logic, or through thinking, or by concluding. One has to look at it for what it is, or it is not., or neither.